Visiting the aquarium with your school is a great way to bring education alive. We offer many interactive opportunities for your students to learn more about marine environments. Most of our programs are correlated to state standards. Please contact us for more details on correlations. If your are interested in bringing a school group to the North Carolina Aquarium at Fort Fisher, please submit a REQUEST FORM. Welcome to the North Carolina Aquarium classroom! 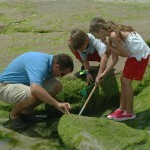 Plan an unforgettable field trip to the North Carolina Aquarium at Fort Fisher. Your students will dive into the world of wonder and water, with a wide array of educational exhibits and programs. Available from April 19th - September 30th. Welcome to the North Carolina Aquarium's Lorikeet Landing! Bring your students to this new interactive, live-animal exhibit with free-flying small tropical birds to learn about the importance of pollinators in nature. This exhibit does not include general Aquarium admission and is closed daily 12:30-1:30 pm for the health of the birds. Nectar cups are $1. Did you know that there are about 10,000 species of birds and they live in virtually every habitat on Earth? In this program we will talk about bird biology and behavior. You will learn about birds native to North Carolina and what they need to survive. We will also give an introduction to the species of birds that we have at the aquarium. After the indoor program we will visit Lorikeet Landing and get to meet and feed some of these magnificent creatures. Note: This program is not available between 12:00pm-1:30pm. Would you like to give your school group a private encounter with a critter of your choice but don’t have a lot of time? 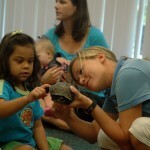 Request a 15 minute Animal Meet and Greet and let your students say “hello” to one of our many live animals! This program is perfect for smaller groups that are on a schedule and a budget but desire an intimate experience to learn about a North Carolina native species! For $1 per student, choose one animal from the following: turtle, snake, alligator, frog, toad, salamander, hermit crab, sea star, or sea urchin. Available Monday-Friday from September 1-February 28 only! Learn about the habits and habitats of various reptiles in the Cape Fear Region. Alligators, turtles, and snakes will be highlighted. Uncover the hidden world of clams, snails, crabs, sea urchins, sea stars, and other invertebrates. Learn what makes a coral an animal, where the eyes of a sea star are located, how an urchin gets around, and much more! Learn the characteristics of sharks in this interactive presentation on shark anatomy and behavior. Discover how sharks swim, how they get along without bones, and how they replace their teeth! How do we compare to some of the largest animals on earth? What is the difference between a dolphin and a porpoise? Learn the answers to these questions and more in this fun, interactive program highlighting the whales and dolphins that frequent North Carolina's coast. Creatures come alive in this story telling and critter creating program. A special craft is included with each program, and some programs include live animals. Spiny-skinned animals, Whales and Dolphins, Crabs and other Crustaceans, Amphibians, Turtles, Reptiles, and Sharks, Skates and Rays. Learn about the different ecosystems we have here in coastal North Carolina during this interesting and interactive program. Explore why these ecosystems are important and meet some of the creatures that inhabit them. Learn about different life cycles of various animals during this interesting and interactive program. 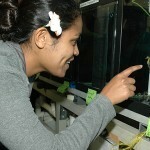 Join staff on a behind the scenes tour and see what it is like to be responsible for the aquarium's critters. This tour will take you places that many guests never have a chance to see. Have your own guide take you along on a front-of-scenes tour following the Cape Fear River throughout our Aquarium which will highlight specific exhibits important to your journey. This tour is recommended for smaller groups that desire a more structured visit with your own private party. Available from October 1st - March 1st. A changing climate is affecting our oceans and the animals that call it home. Join aquarium staff to experience the Geodome; an immersive, inflatable theater with footage showcasing local scientists’ work about effects of climate change on marine mammals. Learn about what we can do to make a difference to ensure a healthy ocean for all living things. Join us for a hands-on program that introduces students to the fun of catching blue crabs. Lessons in the biology of crustaceans, crab rigs, bait, exploring a shrub thicket, pulling a seine or dip net through the salt marsh, and the importance of dunes, marsh grasses, and food webs. North Carolina has over 3,000 acres of salt marsh. Students hike the marsh and discover plants and animals found in this rich environment. Exploring a shrub thicket, pulling a seine or dip net through the marsh, and discovering the importance of dunes, marsh grasses, and food webs. 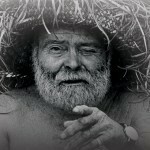 Have you ever heard about the Fort Fisher Hermit? Maybe you were lucky enough to meet him. Join aquarium staff to watch an award winning documentary entitled, "The Fort Fisher Hermit: The Life and Death of Robert E. Harrill." Then take a walk in the Hermit's footsteps out through the marsh to the bunker where he lived. Learn how the hermit lived in the marsh, surviving largely on plants and animals. Test your own skills catching and releasing food from the marsh. Watching the documentary, crabbing, seining, and hiking. Explore Zeke's Island Estuarine Research Reserve by canoe. Participants should be able to swim and be capable of sustained physical exertion. Canoeing, crabbing, seining, or birding. THIS PROGRAM MUST BE SCHEDULED AT LOW TIDE. TIMES AND DATES WILL VARY. Explore the only natural rock outcrop on the North Carolina coast and discover the marvelous marine invertebrates that live in this dynamic habitat. For New Hanover County Fifth Grade Students Only. Learn the ancient art of Japanese fish painting, Gyotaku. Discover the history behind this craft and make a Gyotaku T-shirt to take home. Create your very own incredible, wearable T-shirt with easy to use stamps in fun Marine-life shapes. Students will create their own masterpiece using sand. Paper can be natural...learn how to make it: It's fun, easy, and saves some trees! Education staff guides you through the process of recycling used paper to create new Nature Paper. With a bit of creativity and some help from nature, participants make their own beautiful pages. Your paper can be used for journaling, stationary, scrapbooking, or any other project. © North Carolina Aquarium Society. All rights reserved.